1. Repot autumn flowering orchids. If your orchid flowered this past autumn (like the Paphinias above) it's time to take a closer look to see if it has produced a new shoot. 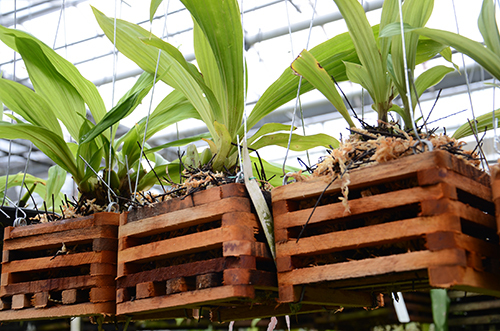 A new shoot is your signal to repot --if your orchid has outgrown its pot or if the potting mix has broken down. Most orchid potting mixes with organic ingredients (bark, moss) only last a couple of years before they start to retain too much moisture. 2. Watch out for slug damage. beer (cheap, expensive, light, dark, imported, domestic). Even though it's kind of fun to offer your enemy a poison-laced skol, I've always been disappointed with the results. the overturned cabbage leaf; the inverted melon/grapefruit rind, the potato/apple slice; inverted clay pots. 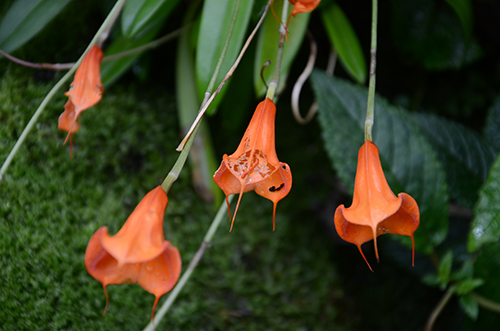 No luck with any of these in our display greenhouse. iron phosphate. Relatively non-toxic to animals. But I still find live slugs in pots that I have treated with iron phosphate. metaldehyde (the active ingredient in lots of slug baits). It works. It kills slugs. It kills frogs. It's dangerous to people, too, at high enough concentrations. With repeated applications you select for resistant slugs. We don't use it any more. If you're buying retail slug killer, be sure to check the label for the active ingredient. laboratory grade caffeine. No kidding. A scientific publication a few years ago documented the effectiveness of concentrated caffeine (a clear odorless liquid available from laboratories) at killing slugs. So we tried it. On the slugs, I mean. Yes, it works, but I'm just not comfortable having the stuff around. I haven't tried the predatory decollate snails that eat our native mollusks. Before trying this I would need to resolve my concerns about introducing non-native fauna into our area. Honestly, the only treatment that has ever worked for me is physically removing the slugs --repotting and replacing all the soil-- and keeping things drier. It helps to know what slug eggs look like. They look like clusters of tiny (1 mm) pearl onions. 4. Come to our Orchid Care Clinic. How is your orchid doing? Have you ever looked for advice on the internet and given up because it just doesn't seem to apply to your plant? Have you ever wished for a walk in clinic for your orchid? 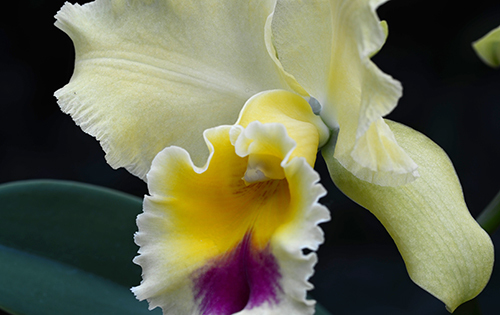 where you could bring your orchid and get personalized advice? or have someone show you how to repot your plant? It's here! This Saturday. Thanks Becky for all the useful information!